Every year, research funders, academic institutions, libraries research organizations, non-profits, businesses, and others use Open Access Week as a valuable platform to convene community events as well as to announce significant action on Open Access. The Week has served as a launching pad for new open-access publication funds, open-access policies, and papers reporting on the societal and economic benefits of OA. I agree that it is important to become actively involved in open access activities – being a passive supporter can mean that one is consuming open resources provided by others, rather than actively engaging in the transformation of the research culture which the campaign is seeking to do. I’m looking forward to seeing the #OAWeek tweets (which is archived on TwapperKeeper) in which people will be describing what they are doing. In this post I’ll describe how I have engaged in open access in the past and how I am supporting the Open Access Week 2012 campaign, beyond registering on the Open Access Web site. Back in 2005 in a paper entitled “Let’s Free IT Support Materials! ” I argued that support service departments, which should include libraries as well as IT Service departments, should be taking a lead in embracing openness by making training materials, slides and documentation available with a Creative Commons licence. It should also be noted that permission will be granted for live-blogging and live streaming of the talk, with permission being clarified on the second slide of the presentation, as illustrated. The licence to share live presentations is one aspect of UKOLN’s long-standing involvement in organising and participating in amplified events and in advising others of best practices in the provision of such events. We are currently developing guidelines for amplified events as part of our involvement in the JISC-funded Greening Events II project. In addition to describing possible environmental benefits which can be gained by enabling a remote audience to participate in events, we will also describe additional benefits which can be gained by adopting a more open approach to events as described by my c0lleague Marieke Guy in a post on Openness and Event Amplification. However so far I have summarised ways in which myself and colleagues at UKOLN have supported differing aspects of open access in the past. I feel there is a need at the start of Open Access Week 2011 to outline new and additional ways in which the benefits of open access can be further enhanced. The BY-NC-SA licence was chosen [in 2005] as it seemed at the time to provide a safe option, allowing the resources to be reused by others in the sector whilst retaining the right to commercially exploit the resources. In reality, however, the resources haven’t been exploited commercially and increasingly the sector is becoming aware of the difficulties in licensing resources which excludes commercial use, as described by Peter Murray-Rust in a recent post on “Why I and you should avoid NC licence“. 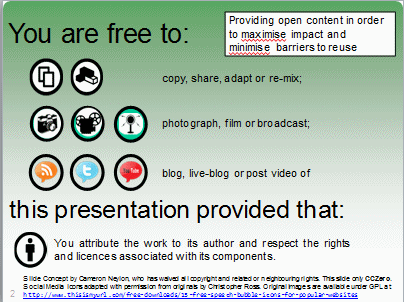 In addition to using this licence for blog posts from 24 October 2011 I also intend to use this licence for presentations I will give in the future – and, as can be seen from the above image, the licence has been applied to the resources I will give in my talk at the ILI 2011 conference later this week. That’s how I’m involved with Open Access 2011 week. What are you doing? This entry was posted on 24 Oct 2011 at 9:40 am	and is filed under openness. Tagged: #OAWeek. You can follow any responses to this entry through the RSS 2.0 feed. You can leave a response, or trackback from your own site.